WASHINGTON — Dazzling views of planet Earth from space are the star of a new PBS documentary that aims to show the interconnected systems of the planet from a truly out-of-this-world perspective. The NOVA documentary "Earth from Space," which will air next week on Feb. 13, combines photos, computer models, video and other data to create a cohesive image of how a weather or geological event on one side of the world could affect life on the other side of the planet. Using satellites to observe Earth from space, and making that information available to the public is changing how people view the world, Waleed Abdalati the director of the Earth Science and Observation Center run through the University of Colorado at Boulder, said Monday (Feb. 4) during a NASA presentation here at the Newseum. The two-hour documentary was produced by NOVA with senior executive producer Paula Apsell, the creator behind NOVA scienceNOW, a popular science news program. Most of the 120 satellites responsible for observing the Earth's processes were launched in the early part of the last decade, and since that time, they have been responsible for changing the ways scientists inspect the atmosphere and track storms, Piers Sellers a former astronaut and scientists involved in the documentary said. "People knew what hurricanes were for a long time, but once you see it from space and take observations from space, the whole phenomenon changes," Sellers said. "I think that's the way our human brains work really. To appreciate the way something works you have to see the whole system, the whole image. It becomes intuitive." Observations made using Earth-focused satellites have helped scientists refine climate models, Abdalati said. None of the 15 climate models that were in use before Earth-observing satellites started sending back data are still relied upon today. Researcher incorporated the new information the satellites sent back from space to create a clearer image of what future climates might look like. Some satellites employed in the creation of the new images used in the documentary were the ocean monitoring Aqua satellite and the polar orbiting NPP Suomi satellite that both help scientists track water circulating through oceans and ice caps. Satellites looking away from Earth also help researchers understand the planet, researchers said. NASA's Solar Dynamics Observatory — an spacecraft pointed at the sun — has given scientists the chance to see the various ways solar wind affects the planet, they added. 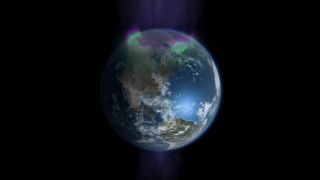 Researchers can now predict how bright the auroras of the Earth's North and South Poles will be depending on the activity of the sun. Although many Earth-centric satellites are still in orbit and working long past their pre-determined life span, many of the 120 satellites responsible for collecting this data are on their last legs and will need to be replaced in the next five or 10 years, Abdalati said. It is important to keep observations like these as continuous as possible, so it is necessary for NASA and other space agencies to keep this fleet of satellites up to date, Sellers added. Next week, on Feb. 11, NASA will launch a new land-monitoring satellite, called the Landsat Data Continuity Mission satellite, to replace an aging satellite that will be retired in the next two years.